It might be hard to find the best turkey fryer in today’s satiated market. Luckily, I’ve put together an article to help you do just that, so have a read! Turkey is one of the most iconic all-American foods, and I see no problem with this. Unlike most folks who do it just for Thanksgiving or Christmas, my family and I eat turkey quite often. But, to tell you the truth, roasting it all the time can get dull, so last year my husband decided to get a turkey fryer and see what it can do. At first glance, this appliance looked kind of intimidating, but I soon figured out how to use it and fell in love with it not long after. The turkey that comes out of it is flavorful and irresistible, and I think that everyone should try to prepare it this way at least once. 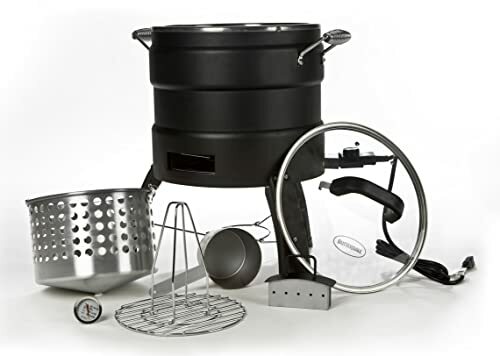 If what I just wrote rings your bells, you’ll want to see the products I reviewed in search of the best turkey fryer in the universe. Why buy a turkey fryer? What to know before buying a turkey fryer? To put it simply, a turkey fryer is an apparatus made and used for frying turkey (wasn’t hard to figure that out, huh?). It consists of a metal pot, a frying net, and a heat source which may vary. Nowadays, we can find different kinds of turkey fryers, so it’s important to learn about all of them before going out to buy one. The kind with propane includes a burner which is connected to a propane tank with a small hose. Basically, it’s the same system as the oven gas burners that some people have in their kitchens. When the burner is turned on, it heats the bottom of the pot to fry the turkey. These models are usually bulkier and more suitable for outdoor use. Electric fryers are commonly made for indoor use, and they use electricity as the heat source. Most of these are made so that they can fit kitchen counters. Generally, speaking these devices are more convenient than the propane ones as you never have to worry about running out of fuel. The bottom line here is that propane equals outdoor use, and electric is for indoorsy, convenience-loving folks. Here, I’m mainly speaking about the propane fryer. It is just an awesome tool for preparing a delicious fried turkey at outdoor events like backyard parties, picnics, and so on. 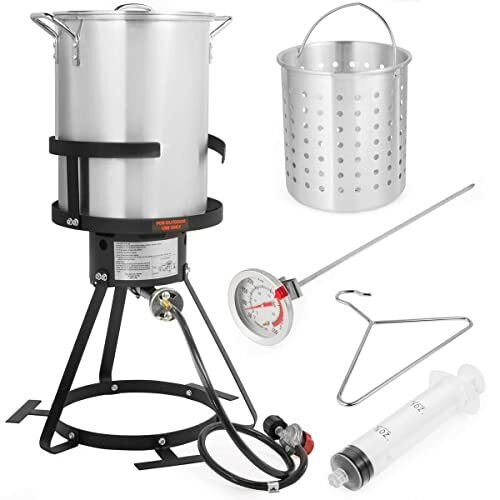 The fryer is easy to carry and set up, and the turkey that you’ll cook can feed an entire crew. Roasting a turkey in the oven can take you well over 3 hours, and not everyone has so much time at hand. Frying is a much quicker process, and it’ll cook the entire thing in around 30 minutes or so. Since the fryer is an independent appliance, this means that you’ll have the oven and the stovetop available for preparation of side-dishes. Let the turkey fry while you whip up some baked potatoes, or a batch of cookies for dessert in the oven. As you already know, fried foods taste really good! The reason for this is that all the juices remain inside the meat, whereas when roasting or grilling, they drip out. This will make the meat juicier and more flavorful than roasting ever could. Oh yes, and the crispy golden skin that it creates is beyond mouthwatering. If you’re a cooking enthusiast, then I’m sure you’ll enjoy this apparatus very much. Many of fryers are quite versatile and will also allow you to boil and steam meat, so you can get all sorts of flavors from it. Also, it’s not just for preparing turkey and can be used for other types of poultry as well. Some of these fryers are oil-less, meaning that you do not have to drench the turkey in fat to cook it. The result will be just as delicious as the one you get from oil, except that it’ll have much fewer calories and will be healthier. The size of the fryer represents the outer dimensions, and you need to figure out whether the model that you’re buying is going to fit your kitchen counter. The capacity lets you know how big of a turkey you’ll be able to fry. In general, electric fryers can handle turkeys of up to 14 pounds, while propane ones can go up to 18 pounds or more. To put this into perspective, 14 pounds of turkey can easily feed almost ten people, so unless you’re cooking for a small army, don’t worry about the capacity. The fryers which use oil cook faster than the oil-less ones, and prepare juicy and tasty turkey. However, the meat coming from them is going to be less healthy. Oil-less models utilize radiant heating techniques and operate a bit more slowly than the other type. The turkey you get from them is different but just as delicious as the one fried in oil. a marinade injector, to make the dish even juicier. All of the above would be the “usual” additional features, but some appliances might offer even more options. As I’ve previously mentioned, propane fryers are great for outdoor use while electric ones are better for indoor cooking. However, if you want to fry a turkey in your backyard, you’ll be able to use the electric one too, as long as you have an extension cord to plug in inside the house. Folks who are looking to feast on fried turkey in the sun should definitely check out the model from STKUSA. This is a straightforward, outdoor fryer, and now I’m going to tell you all that it can do. First off, the external dimensions of the apparatus are 13.5 inches in diameter and 33 inches in height (with the burner included). The volume of the cooking pot is 30 quarts, and it is enough to fit a bird that weighs up to 20lbs. A turkey of this size will feed more than a dozen people, so the fryer is perfect for party food preparation. Second, this fryer uses oil, and it is meant for outdoor use only. There is a small hose that runs from the burner that you need to attach to a propane tank for it to be able to work. After that, heat up the oil and carefully lower the turkey in it. To help you perform this action safely, a metal hanger is included in the price. Last, there are several additional features that come in the package including a thermometer and a marinade injector. If you thought that the previous fryer was big, wait ‘till you get a hold of this one! Bayou classic is a product for those who want to prepare some huge birds, and now I’m going to inspect it. When it comes to its capacity, Bayou has a whopping, 42 quarts. This means that it’ll be able to fit turkeys of up to 25 lbs. The pot has a 15.75-inch diameter and an 18.25-inch height. I’d say that this would be a fantastic tool when cooking for large groups. Just like the STKUSA’s model, this one too uses oil, and it is strictly made for outdoor use. When buying Bayou’s product keep in mind that it doesn’t come with a burner, so you’ll have to get one separately. 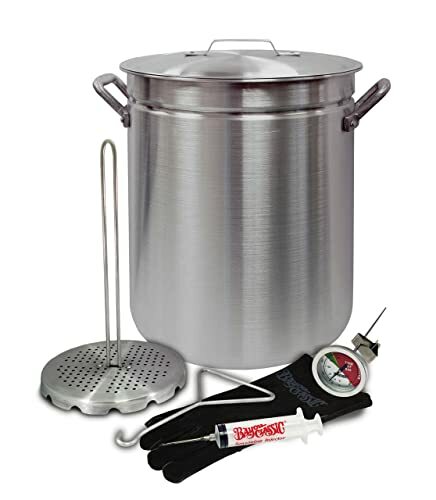 The additional features that come with the pot include a leather glove for safer handling, a rack and lift hook, a marinade injector, as well as a stainless steel thermometer. I can say that this is all that you’ll ever need. Those looking for a versatile and simple-to-use piece of cooking equipment should not miss out on the Backyard Pro Fryer and Steamer. As the name implies, this apparatus is intended for outdoor use. The pot has a height of 15.5 inches and a diameter of 12.2 inches, so it’s not the biggest in today’s list, but it’s far from being small too. Its capacity amounts to 30 quarts, just like STKUSA’s model, and this will fit a turkey of up to 20 lbs. Now, the real charm of this product is that it can also be used as a steamer - just pour in water instead of oil and steam up your favorite seafood (or whatever you like). To be frank, it’s possible that other fryers can do this too, but this is the first one where the manufacturer mentions it. Just like the previous two models, this one too includes a thermometer, a marinade injector, a poultry rack. The burner comes in the package, so you won’t have to buy it on its own. Now, here’s something a little bit different from what you’ve seen in this article. 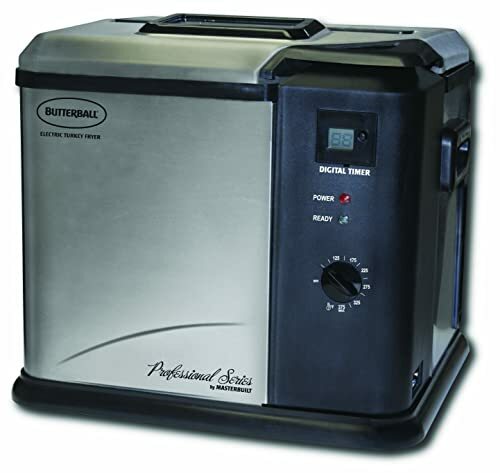 Masterbuilt’s cutely named Butterball is an electric fryer, and if you don’t like messing around with propane, check out this one. The external dimensions of the fryer amount to 18 x 23.2 x 26.2 inches (W x H x D), so this model is slightly smaller than the others I listed. With this size, you’ll be able to cook a turkey of up to 18 lbs. Despite, being electric, this fryer is made for outdoor use, so it’s not for your kitchen. Also, this is an oil-less model which I’m sure healthy-eating enthusiasts will take to a liking. However, you’ll have to use a tiny bit of oil to lubricate the frying net. The extra features of Butterball include a thermometer, a rack, and a wood chip box for smoking the meat. The controls are analog and very easy to operate, and there’s a safety clip on the lid to make the entire process care-free. The last product for today is yet another fryer from Masterbuilt. This one, however, is intended for indoor use, so if it often rains in your region, you might want to read about it. Let’s begin by talking about the size, and the dimensions of this Butterball are 15.7 x 14.2 x 14.6 inches (W x H x D). This is by far the smallest model in this list, and it’ll be able to fry you up a 14 lbs bird. But, with small size comes speed, and the cooking time for a whole turkey is only around 4 minutes. As this is an indoor device, make sure you have enough space on your counter. You’ll be happy to hear that the controls are very straightforward and you probably won’t have troubles using it. This fryer does require oil, but it uses 30% less of it than other products of this type. The fryer comes with a frying basket, a carrying handle, and a detail instruction manual to ensure that you’re using it safely and correctly. All this talk of fried turkey is making me hungry! But, no time for cooking, because now I have to conclude this article by declaring the winner. I chose Masterbuilt 201000809 as the winner of today’s roundup, and I’m going to tell you why. Frankly speaking, this product is the most convenient to use for me, it’s super simple to operate, and it can fit a decent-sized turkey. Also, the oil-less version is healthier, so that’s another big bonus. 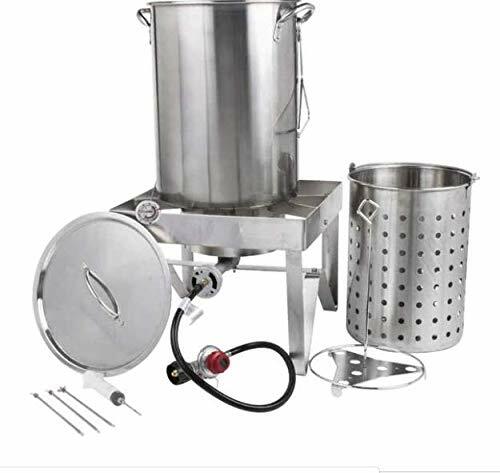 In case you want something bigger (or smaller), do check out any of the other fryers from the list, as I’m sure that you’ll be satisfied with any of them.